The life insurance brand also bagged a Guinness World Record for most people holding a plank together. What started with a video asking viewers to hold a plank (an exercise position) for 36 seconds, eventually turned into a mega outdoor act a 'Plankathon' for Bajaj Allianz. The life insurance brand bagged a Guinness World Record for 'the most people holding the abdominal plank position' in Pune. The brand had launched its #36SecPlankChallenge campaign in September with a video on social media. It challenged viewers to hold a plank (an exercise position) for 36 seconds and challenge friends to do the same. Participants/challengers were to shoot a video and upload it on social with #36SecPlankChallenge. ALSO READ: Why is the CMO of Bajaj Allianz doing a plank on LinkedIn? Chandramohan Mehra, chief marketing officer, Bajaj Allianz Life Insurance, says "The Plankathon initiative reflects our commitment to promote and enable a massive fitness movement that could put India on a global map. The success of #36SecPlankChallenge campaign encouraged us to take the initiative to a higher level." Mehra Further says that the participants needed to hold a plank for at least a minute to qualify for the Guinness record and the bar had to be raised from the initial plan of 36 seconds. 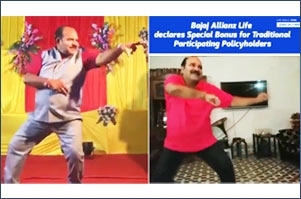 Why is the CMO of Bajaj Allianz doing a plank on LinkedIn?